Just because something is natural does not mean it is good for you or harmless. Toadstools are natural, but those mushrooms are poisonous. PMS MAY also be provoked by some plants, foods and herbs. The therapeutic effect of Natural Progesterone may also be blocked by some herbs. Beware of some herbs that MAY encourage Premenstrual Syndrome. Coffee is a known phytoestrogen. Since it is a phytoestrogen, decaffeinated coffee may still be able to act as an estrogen. In the 1940's, the sheep farmers of Perth in western Australia began to experience an epidemic of still births despite three seasons of exceptionally good weather. The handsome merino sheep looked healthy. However, the ewe's failed to go into labor; the lambs died in still birth and often the mothers as well. In a matter of 5 years, the ewes failed to conceive at all even after repeated breeding with fertile rams. Federal and agricultural specialists found the problem. Clover. 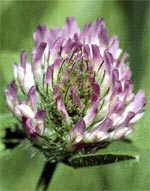 Fifteen years earlier, ranchers had imported a clover from the Mediterranean region in Europe. The first scientific paper on this phenomenon appeared in the Australian Veterinary Journal in 1946 and proclaimed this as "clover disease". Three years later three chemicals were identified as suspects. Finally, formononetin only one of the chemicals was determined to be the culprit. Formononetin mimics estrogen. Coumestrol found in sunflower seeds when fed to the mother rat caused permanent reproductive problems in the rat pups: female pups when grown did not ovulate, and the male pups had altered mounting behavior and fewer ejaculations. Neonatal rats and immature rats exposed to coumestrol had premature estrous cycles. Flax seed oil and Soy oil are known NOT have the active phytoestrogens. Sunflower oil MAY or MAY NOT have active hormone components in it. During the fourth century B.C., Hippocrates noted that Queen Anne's Lace prevented pregnancies. The Greeks used this plant as a contraceptive. Modern research confirms strong estrogen activity. Used in the ancient world to prevent pregnancy and precipitate abortions. Zava, Ph.D. showed that these herbs stimulated estrogen receptor positive breast cancer cells to grow. Red Clover and Yucca were found to be equal in potency to estradiol at the same concentrations. Women who harvest hops for beer begin menstruating 2 days later anecdotally. Zava has confirmed that beer has a significant amount of phytoestrogens that have moderate estrogen activity from hops used in the flavoring of beer. Bloodroot, Ocotillo, Mandrake, Oregano, Damiana, Pennyroyal, Verbenna, Nutmeg, Tumeric, Yucca, Thyme, Calamus rt., Red Clover, Goldenseal, Licorice, Mistletoe, Cumin, Fennel, Camomille, Cloves. There are separate estrogen and progesterone receptors. Zava, Ph.D. was able to show that the above herbs are able to bind to the progesterone receptor. These herbs would compete against any natural progesterone taken and should also be avoided. Interestingly enough all the progesterone binding herbs were antagonists or neutral meaning they competed against progesterone and worked against it or blocked progesterone. None of them were progesterone stimulators. Bloodroot, mandrake, pennyroyal, yucca, and mistletoe all have very strong progesterone binding activity and are used as abortifacents (create an abortion), and to bring on menses. Bloodroot was used in England to treat breast cancer 100 years ago, and was used by Native Americans to treat surface tumors. Herbalists today use it to treat breast cancers, nasal polyps, and cervical dysplasia. Mistletoe has been used for 100 years in Europe to treat breast cancer and leukemia. Zava, PhD also found that Mandrake, Bloodroot, and Juniper stunted the growth of BOTH estrogen receptor positive breast cancer cells and estrogen receptor negative breast cancer cells. Saliva estradiol results also showed very low estradiol in women taking the Chinese herb Dong Quai. It is thought that Dong Quai suppresses estradiol synthesis. Pharmaceutical companies routinely travel to the jungles to seek native cures. They modify traditional herbal remedies to create prescription drugs. One such example is digoxin that is derived from a traditional Irish tea and the fox glove plant. Many herbs, foods and spices have estrogen activity as well as progesterone activity. In general, if a people group has been eating a particular food for centuries and have relatively small amounts of estrogen linked diseases, the food is safe to consume in reasonable quantities. The following spices and herbs may encourage Premenstrual Syndrome. Avoid them. Avoid Sunflower Seeds, Red Clover Tea, Camomille Tea, Alfalfa Sprouts, Queen Anne's lace (wild carrot), Pomegranate, Fennel,Licorice, Red Clover, Yucca, Hops (Beer) and Motherwort.